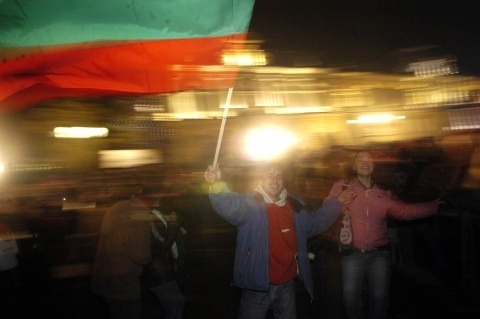 Thousands of people in Bulgaria celebrated New Year's with events at downtown squares organized by local communities and authorities. The open-air celebrations of the advent of the New Year with live music, wine, fireworks, and traditional round dances ("horo") – in spite of the midnight winter cold – have emerged as a popular tradition in Bulgaria in the past couple of decades. The largest New Year's happening was the show in downtown Sofia, which was broadcast live on the Bulgarian National Television, BNT, and featured a number of popular pop and rock performers. BNT and the Sofia City Hall organized the celebration on Knyaz Alexander Battenberg square for the 14th time in a row. In addition to the concert, "The Stage under the Stars" show included a carnival, circus performances, pyrotechnics, a DJ review, fireworks, light effects, and prizes. Many Bulgarian municipalities treated those attending the community celebrations of the arrival of 2013 with New Year's banitsa – traditional Bulgarian pastry with luck charms. Some Bulgarian municipalities – Veliko Tarnovo in particular – provided free beer, wine, roasted pigs, banitsa and deserts. Similar events were held in most other major cities such as Plovdiv, Burgas, Blagoevgrad, Dobrich, Pleven, Ruse, Sliven, and Yambol, among others. The show in the Black Sea city of Varna, featured as its main star Joe Lynn Turner former Lead singer for Yngwie Malmsteen, Ritchie Blackmore's Rainbow, Deep Purple, and Fandango.